A brief list of things that have made me happy recently. This entry was posted in Bear thoughts and tagged @a_single_bear, bear blogs, bears, blogs by bears, humor, lists, me, nature, other bears, others mes, the forest, twitter on September 18, 2017 by A bear. Even though I spend all of my time in the forest, I feel like I have not explored very much of it. Sometimes I will walk for a long time in one direction, hoping to feel the excitement that comes with treading unexplored territory, but I usually get too scared or intimidated by the immense size of the forest to go very far in any one direction. I end up back in my cave, enjoying its comfortable and familiar damp pointy walls. In an attempt to challenge myself and explore more of the forest, I recently tried fighting the urge to turn back at the sight of the unfamiliar during one of my brief forest excursions. I walked away from my cave in a direction that was not toward the river or my favorite tree or the very interesting looking rock I like so much. I went in a direction that was unfamiliar, and I just walked. Aimless but attentive, taking in the sights and the sounds of the forest as I went. The more attention I gave to those sights and sounds, the more I began to feel like everything I was experiencing was very familiar. I walked until the sun was almost ready to retire into the trees past my sight, and I did not feel like I had seen anything new. It was all very lovely, for sure. I do adore the sights and sounds of the forest, no matter how frequently I experience them, but everything felt more familiar than I had anticipated. Usually that far into a walk, I would be ready to run in whatever direction I had come from, but where I went felt safe and known. Especially when I got to a cave. It was a nice cave. It was damp and rocky and comfortable. It had a delicious and soft bed of moss in one corner. Another corner had a fine collection of rabbit skeletons. There were some leaves spread about. It was wonderful. It was familiar. Was it my cave? It felt like my cave. It smelled and tasted like my cave. I had walked away from my cave, though, so I was confused. What was I supposed to do? I did what came naturally to me: I slept in the cave. When I woke, it still felt like my cave. When I went outside of the cave, it felt like the outside of my cave. Either I had just walked back to my cave by accident or I had stumbled upon an exact replica of everything I knew. I was not sure which was true, so I licked the pile of moss in the corner and napped a little longer. It felt right, and, really, either way, I felt like I was at home. This entry was posted in Bear thoughts and tagged @a_single_bear, bear blog, bear blogs, bear stuff, bears, caves, etc, familiar stuff, humor, new things, twitter, walking to stuff on June 12, 2017 by A bear. 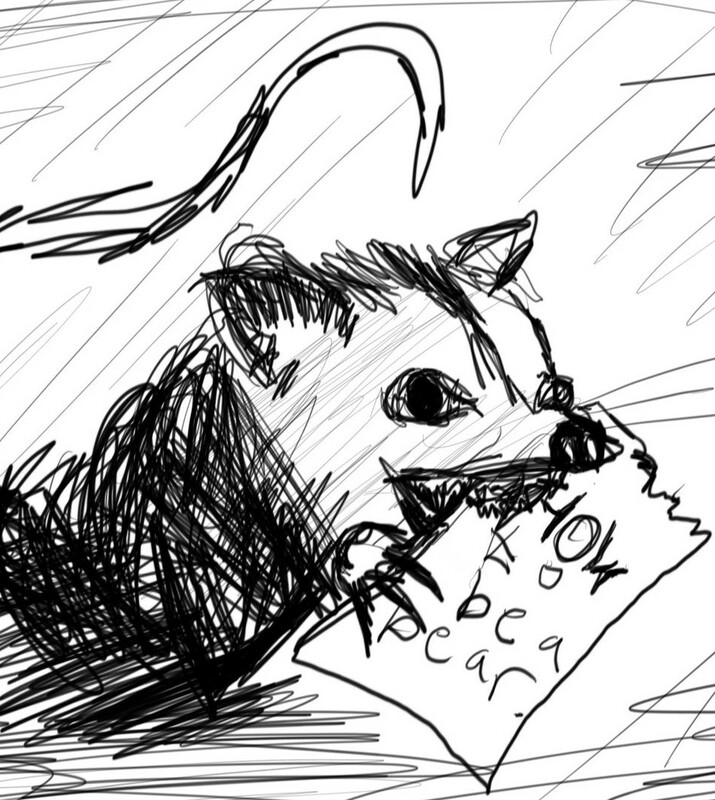 A moon bear to replace me while I sleep. That the sun has such a lovely complement in the sky, a calm partner who takes care of the forest while the sun goes down to rest or plan or whatever else the sun might do when it falls, is something I have always admired. Sun goes down. Moon comes up. Moon goes down. Sun comes up. So on and so forth, in lovely sync. You can even sometimes see them both at the same time. It is one of the few predictable shows of the forest. The sun will go down. The moon will come up (though, once in awhile, it does not, but that is okay, everybody needs a break). Sometimes I wonder if the sun or the moon even knows about their respective opposites, though. Does the sun know, or even care, that the moon picks up its work during the cool, gloomy nights of the forest? And the moon? Does it realize that we get most of our warmth and light from the sun? Does it care? I have a feeling that the two are completely unaware of one another, which makes me wonder about any possible complements I might have that I am unaware of. 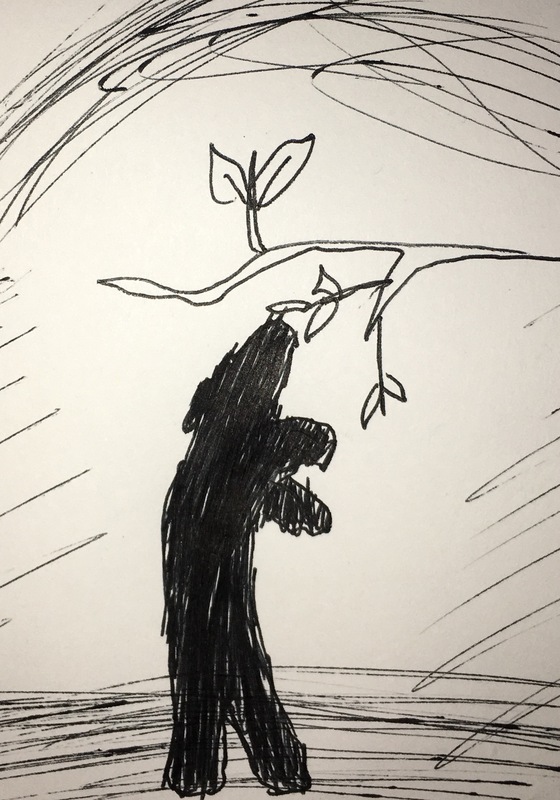 The idea of some moon bear out there in the forest, doing bear things that I do during the day just so the forest can have some kind of bearness going on even while I rest, is very intriguing to me. 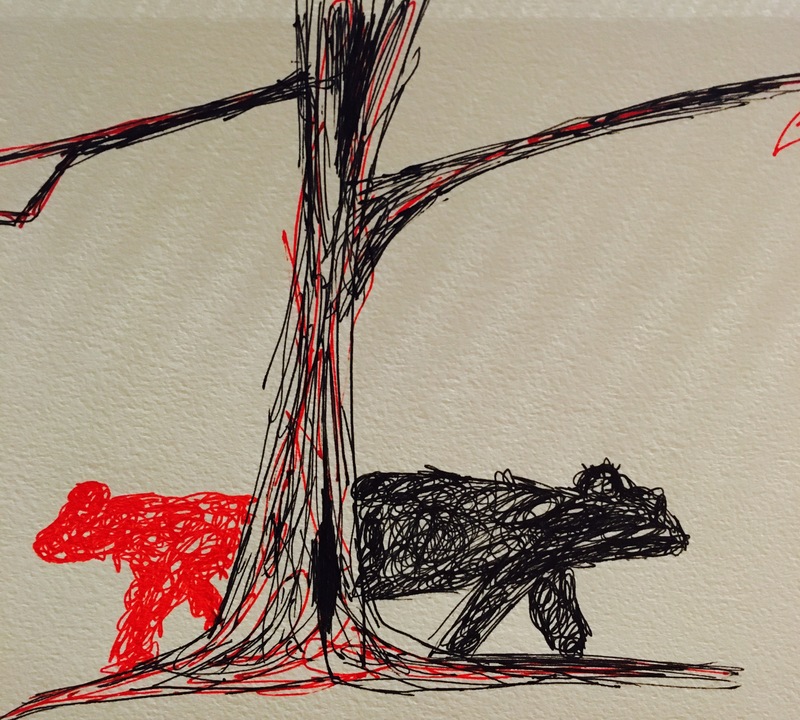 I would love to know that bearness similar to mine is being represented in the forest even when I am unable to represent it. I stayed out late recently to try to find out. I walked about the forest as the surprisingly bright moonlight flooded the forest floor and guided me. It was nice to feel the cool night air, but it was unfortunate to not stumble upon any such moon bear. I found no bears at all. I found no moon-anything at all. The only moon there was was the moon itself. I entertained the idea of maybe all the trees I saw being moon trees because of their overwhelming darker, calmer colors, but then I remembered that was just because they were not bathed in sunlight. I went back to my cave. I slept. 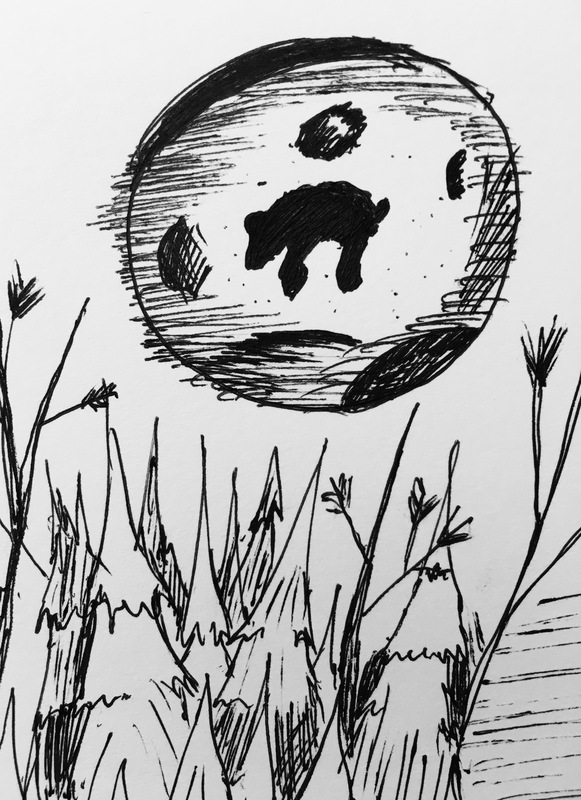 I woke up wondering if I had just missed the moon bear. Maybe it was looking for me, the probably sun bear, at the same time I was looking for it. Maybe it was taking its rare break from its duties like the regular moon does ever so often. Maybe the moon bear exists and we are not meant to meet. Maybe it is possible to see us at the same time, at the right place, at the right angle, but we can never see one another. We just chase each other instead, never actually meeting. This entry was posted in Uncategorized and tagged @a_single_bear, bear blogs, bears, blogs, caves, humor, moon bear, moonlight, sun bear, sunlight, the forest, the moon, the sun, twitter on April 3, 2017 by A bear. No bear ever sat me down and told me how to be a bear. How to push my paws into mud because it feels nice. How to avoid dipping my nose into the river while lapping up a refreshing drink. Why dipping my nose in water is bad. How to climb trees and not embarrass myself in front of birds (something I am still not great at). How to get into dumpsters. How to communicate with other dumpster dwellers. How to pick out a good stick. How to be a bear. I had to figure out how to be a bear by myself for the most part. It involved a lot of guess work and mistakes and one time I almost drowned (the nose in the river thing was a hard lesson to learn). I have been considering creating and sharing a set of instructions on how to be a bear. I think it would be nice if other bears, even other creatures interested in being a bear, could have have some guidelines on how to be a bear. I have no idea what exactly would go into the instructions. Surely the water and nose thing. But what else? What actions and experiences make being a bear? Do I catalog how I walk and eat and think and that time I saw twenty birds yelling at the empty vessel of a flattened raccoon? I am not sure what is most important about being a bear. And I do not even know if I am the best creature to determine what is most important about being a bear. Surely there are other bears who have important ideas of bearness that differ from mine, and who am I to tell any creature that those views are any worse or better than mine are? I suppose I cannot determine what the best practices for being a bear are. I can only determine what the best practices for being a me are. And I am a bear. This entry was posted in Bear thoughts and tagged @a_single_bear, bear blogs, bear things, bears, been here and done that, how to, how tos, humor, I am a bear, instructions, nature, twitter on March 6, 2017 by A bear. How to approach humans: an important guide by a bear. If you spend enough time in the forest, you will eventually come across a human. Humans are by far the strangest creatures in the forest (and I have my doubts as to whether or not they even actually live in the forest). If you do find yourself in front of a human, it is important to know some facts and guidelines about them, their demeanor, and how/when to approach/avoid them. Humans seem very scary upon sight, but it is important to remember that humans are generally just as afraid of you as you are of them. That might seem untrue when you hear the way they yell at you when they find you pawing through their seemingly abandoned tents, but always remember: humans are more loud than they are scary. How many humans are there? Are they clearly in a group? You are far less likely to encounter a single human, so remember that even if you only see one human, there are likely more close by. Is the human making sounds? If so, that human is probably about to yell. Is the human yelling at you, specifically? Maybe at another human? Maybe at the trees? 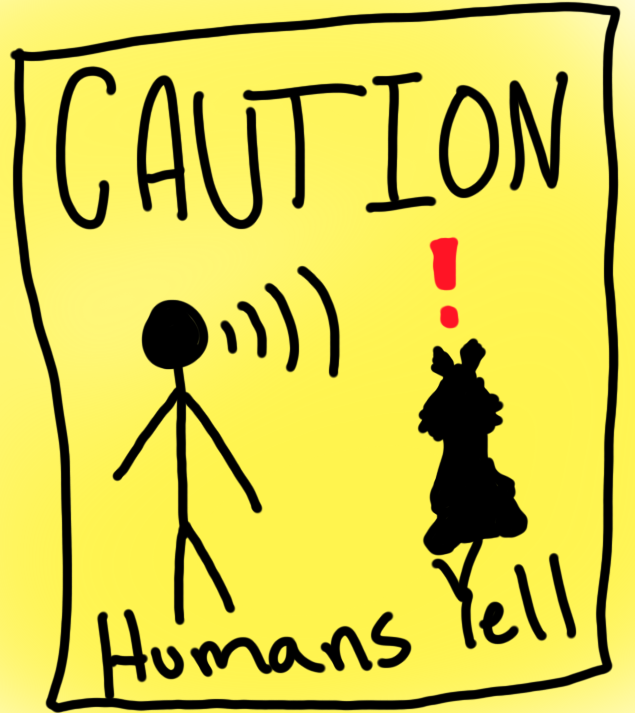 Maybe the human is just yelling because he/she likes to yell? It can be hard to tell, but nobody likes to be yelled at or be near someone who is about to yell, so remember how much humans love to do it. Always run away from humans. They will not chase you and, even if they do, they are not very fast. Frankly, you should probably just skip to this step of the process for every encounter you have with humans. Humans are scary, there is no around that, but by using the H.U.M.A.N process (or at least the last step of it), you can avoid being yelled at by them. Good luck with your future human encounters. This entry was posted in Bear thoughts and tagged @a_single_bear, bear blogs, bears, blogs, guidelines, h.u.m.a.n, human encounters, humans, humor, nature, process, step by step, the forest, twitter on February 1, 2016 by A bear.